It takes a lot to invest your time into a TV series when there are so many to choose from. If a show doesn’t connect in its first episode, many (i.e., millions of) viewers will give up immediately. Each episode each week needs to further this connection by giving more to those who’ve been invested since the beginning while being accessible enough to those who have just stepped into the series. Instead of a complex, over-arching story you can sink your teeth into, we’re given the fast food of television – a relatively disconnected mix of episodes that don’t bother to build complexity into characters, mythologies or worlds around them – because they can’t afford to, if they’re going to continue to attract new viewers. Doctor Who used to deliver really well-developed, long-form story arcs. Bad Wolf, anybody? 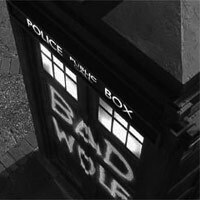 Each individual episode had its Big Bad of the week, to be sure, but underpinning it was the (seemingly) eternal mystery of what the Bad Wolf message meant. When the truth was revealed, Rose Tyler’s place was cemented into New-Who history. The development offered to her through the Bad Wolf arc gave her character growth and opportunity. We were given enough during each episode to keep guessing, without being patronised. Rose was our vessel into the Whoniverse, and we saw Rose go from ordinary to awesome. Doctor Who was fantastic. Doctor Who today? Not so much. Don’t get me wrong – the 50th Anniversary special was amazing. Gob-smackingly amazing. Perhaps because it was packaged as a single (extra-special) episode – perhaps the format saved it – perhaps they spent a LOT of their writing, editing, and filming mojo on it. But Doctor Who the series? We’ve had one of the best Doctor’s (Matt Smith) and some of the best television writers of our time leading the way, and I find my interest waning. I find myself watching Doctor Who out of loyalty. The story arcs are there, but aren’t as interwoven as they once were; as though they are tacked on purely because someone in production said they had to have one – because it’s expected, not because it’s needed. The mystery of Clara Oswald, for example. Each week we were treated to a seemingly disconnected episode from most others, and at the end of the episode, it was as though the Doctor would suddenly remember that he was supposed to be figuring out who Clara was. “Who are you, you impossible girl! ?” he would proclaim at the end of the episode, and we would be no further into unravelling the mystery for ourselves. With no new information, theories about who Clara was ran riot based on things as lame-assed as what Clara was wearing that week – I believe purely because we had nothing else to speculate with. 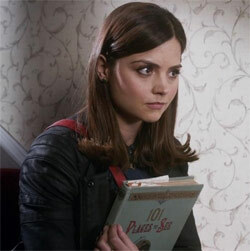 This lack of proper arc progression meant Clara’s character, and her big reveal, fell flat on its face. When it was revealed – and I’ll leave the truth unsaid for those of you who haven’t seen it (and care) – I rolled my eyes. So what, I thought? I don’t care enough about Clara to care about this. In fact, in each episode that season, Clara’s character could have been substituted for a random new companion each week; that’s how much difference I felt she made to the show. I have the same blind-spot loyalty when it comes to SHIELD. You know what SHIELD is: the uber-awesome-sounding Avengers spin-off TV series managed by the Whedon alum (Jed Whedon, Maurissa Tancharoen), starring the much-loved Clark Gregg as the legendary Agent Coulson. 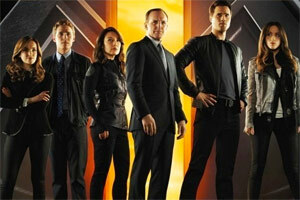 SHIELD is about six Agents working within the organisation called SHIELD, lead by Coulson, who live in a matte-black coloured plane and fly around the world, stopping threats and um, vaguely referencing the Marvel universe every so often so we remember they’re connected to it? Sigh. I don’t know. Honestly, we’re fifteen episodes into season one, and I don’t know what SHIELD is about. I am watching it because I’m loyal to anything created by that crew, and because I’m hopeful, like Dollhouse did in episode six, that SHIELD will suddenly find its way and become amazing. But SHIELD is technically everything I miss about television. It has an involved story arc that’s built upon little by little each week. It has several, to be honest, and I don’t doubt they will connect in some way as the series continues. Characters are challenged and changed and built upon by things that happen to them during episodes. This isn’t really a series you can step into part way through. So what’s wrong with SHIELD? Why isn’t this show of the year? A part of it comes down to the same problem Doctor Who has had in recent years; the notion that much bigger things are going on, and we’re not allowed to see them. In Matt Smith’s finale, The Time of the Doctor, a lot is condensed down into a single hour. So many new aliens and orders and enigmatic characters introduced; the truth of the Silents revealed; so much time spent in the town called Christmas on the planet called Trenzalore. Fighting, defending, a three-hundred year war – everyone evolving or ageing – Cybermen creating wooden forms of themselves to get through forcefields and the Doctor fighting alongside the Silents at the close. Most importantly, the crack in the wall revealing that Gallifrey has survived, and the message being projected through asking the only question; “Doctor who?”. This is a plot that could have easily been spaced out into an entire series. By cramming in so much – answering so many of the unanswered questions for Eleventh’s incarnation in a single episode – we were cheated out of all that groundwork that had been laid for the past three years. Something that should have been much, much bigger was squished and given none of the attention it deserved for so much lead up. I couldn’t help feel a bit betrayed. SHIELD has this problem as well; it is part of the film-franchise Marvel universe, but it isn’t allowed to show much from it – probably because they want to save all the good stuff for the films. As a viewer, knowing that there are superheroes and aliens out there, but being treated to human-villain-of-the-week-#76, then name-dropping Director Fury or Thor every so often leaves you feeling a little cheated out of what it should be. A few years ago I would fight tooth and claw in the defence of various Doctor Who companions. You either loved or hated them, and whatever the stance, you would stand up for your reasons. Now? I honestly don’t care enough about Clara’s character to bother and I don’t feel connected to her at all. She is an empty shell; devoid of the development her character should have had, and as I mentioned earlier, could easily have been replaced in the majority of her episodes by a one-off companion-of-the-week, like David Tenant’s Doctor had in series four-b (or whatever we call it – The Next Doctor to The End of Time). Unfortunately the companion character of Who is supposed to be the viewer’s eyes to the show, so without that character development, I don’t feel as though I’m connecting with Who any more; it feels empty – just like Clara. The same can be said for the character of Skye in SHIELD. Skye is to SHIELD what Gwen Cooper was to Torchwood; the newbie – the character whose eyes we see this new and amazing world through – the character we get to learn and grow with. Skye is a hacker, trying to crack into SHEILD’s security or something, when Coulson and his team bring her in and end up recruiting her. 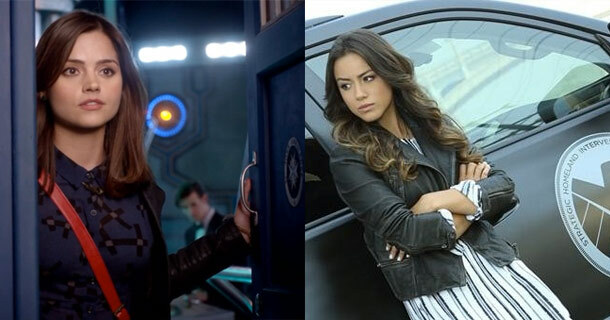 But there’s something about Skye (who’s last name is I Don’t Care) that makes it impossible to connect with her, and since she’s supposed to be our way into SHIELD…well, we have the same problem as Doctor Who. If I don’t care about her; I don’t care enough about SHIELD itself. Maybe it’s that she acts like a brat most of the time; maybe it’s that Coulson has this blind spot when it comes to her, where Skye can do no wrong and never seems accountable for her actions. The one time she is made accountable, everyone on her team breaks every rule and stops everything else they’re doing to save her. And then, maybe, Skye has been portrayed this way for a reason, which will become clearer later in the series? But right now, like Clara, Skye is Awesome because Coulson and the show-runners tell us she is, not because we get to see her become awesome. As a know-it-all who has virtually no rules (or at least, ramifications), who is perfect at what she does and respected without having to earn it, she is not the ideal character for us to be trying to learn about SHIELD with. We would have been better off with Skye being an existing member of SHIELD and either the adorable Fitz or Simmons being the newbie and our eyes to the show; they are at least likeable. Loyalty keeps me going back to Doctor Who and SHIELD, but both are leaving me feeling worn down. I want more – so much more – from both, and with the names behind each, there is really no excuse to not deliver something amazing. But to be honest, none of this matters. It really doesn’t. I am loyal, whether it be based on nostalgia or foolish hope. Whether it’s because I remember what it used to be, know what it can be, or because it’s simply better than the majority of TV shows out there, I will keep watching. The potential is there – I just wish they would break through and be great, to prove that my loyalty isn’t misplaced. 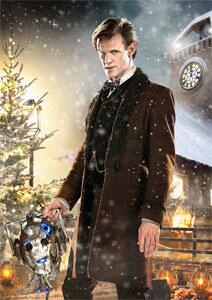 I think Doctor Who feels important is because it’s a great story – an alien who can travel throughout time and space? Who wouldn’t want the opportunity as the next companion? Any genre, any time, any place, and all of the places you’ve never ever been. I wanted to like Clara. I really did. We would have been better off with the 19th century governess version. I just can’t care for modern day Clara at all. There is no substance to her, nothing that makes her feel like a human rather than a cipher. I say this as someone who has healthy respect for Moffat and thinks the social justice warriors, in particular, who spend every second shouting sexism, racism, everything ever ism, are more than a little bit silly. I am willing to admit, however, that my fave is problematic. Perhaps there should be a rule that each show runner can only write two series before handing on the reins? I think all of the writers are misusing (modern-day) Clara as a vessel to talk to the audience through, instead of making it the other way around – our way to engage and connect with the show. So they’ve sort of lost the opportunity to give her character substance in its own right, now. Particularly since (if the rumours are true) JLC is leaving Who at Christmas ’14.